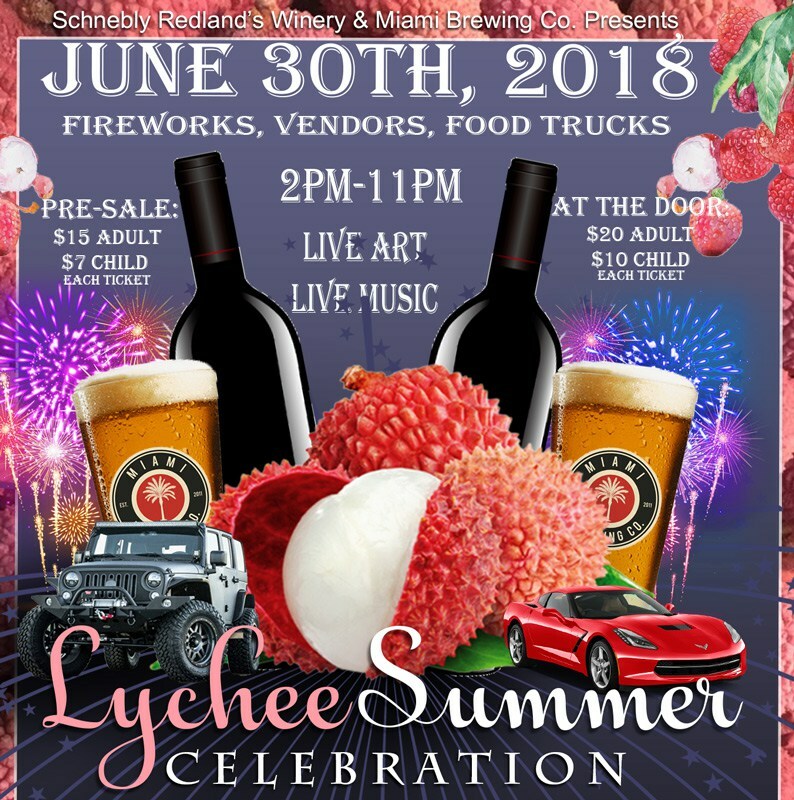 Schnebly Redland’s Winery, Miami Brewing Co. and the South Dade Chamber of Commerce proudly present The 3rd Annual Lychee Summer Celebration. Saturday, June 30, from 2pm-11om, celebrate the United States’ Lychee Fruit Harvest at Schneblys Redland’s Winery. Welcome the family-friendly summer lychee harvest with the 3rd edition of the Lychee Summer Celebration. Patriotism will run high as Schnebly Redland’s Winery will release the fruits (hah!) of their labor, with complimentary admission for all active or retired military. Our dried Fruits of Summer mix, or “Better Than Candy!” individual single-fruit packs – try one or all. They make great party snacks. Made with organic, Redland-Raised fruit with nothing added but love. WARNING: they are deliciously addictive! Check out all the activities! Spend the day on the grounds of the Schnebly Farm sampling lychee wine from the winery and special-release beers from Miami Brewing Company. Enjoy culinary takes on the lychee fruit from a variety of restaurant and food truck partners. Peruse more than forty artisan and craft vendor offerings, and watch some of the area’s best muralists create during Live Painting Sessions. Sample lychee-inspired fare in the Culinary Grand Tiki Lounge as the best chefs around offer their take on lychee cuisine, using the freshest fruit possible. Check out more than a hundred classic and custom cars, with Chevrolet Corvettes, Jeeps, and 4x4s at the Auto Showcase. Take on the Beer Mile in the Schnebly Family Charity Run, benefiting the American Cancer Society. AJ Gayton + Apache Dragon, T-Wave, and more will keep the party going all day at the Chamber of Commerce Stage with Nonstop Live Music. Early-bird tickets are $15 for adults and $10 for children under 12. Children too young to walk are admitted for free. All Active or Retired Military enjoy free admission.